Manuel Roman is a loving father of 2 children, a 5-year-old and a 1-month-old baby. He was detained by immigration agents on his way home November 2014, only 2 weeks after his daughter was born. He has been at Dodge County Detention Facility since. Although Manuel has one misdemeanor for simple possession, he should not be considered priority for deportation according to the Department of Homeland Security’s own criteria outlined in Secretary Jeh Johnson‘s November 20, 2014 memoranda. In addition, he would be eligible for President Obama’s Deferred Action for Parental Accountability (DAPA), since his children are U.S. citizens. Manuel has been in the country since he was 16 years old and have made this country his home. His entire family lives in the U.S. His detention has brought his daughters and his wife economic troubles and mental trauma. His wife had to move their two daughters out of their home and into a relative’s house because they were no longer able to pay for rent and other bills. His children have had to seek psychological treatment for their mental health and distress. 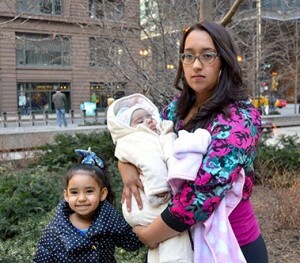 Despite several requests from Manuel’s family and attorneys the Chicago ICE Office has refused to follow its own priority guidelines and exercise discretion to close his case or release him from detention. Manuel is scheduled to be deported tomorrow, Tuesday December 1, 2015. Please sign and make a call to ICE below. I am writing in support of Manuel Roman (A# 206 274 132) the loving father of two U.S. citizen children, a four-year-old and a four-month-old currently detained at the Dodge County Detention Facility. I am aware that Mr. Roman has one misdemeanor for simple possession, however this should not make him “priority” for deportation, according to DHS’s own priority guidelines. In addition, his detention has brought his U.S. citizen daughters and his wife economic troubles and trauma. Mr. Roman’s wife and two daughters were forced to move to a relative’s house because it became impossible to pay the bills and rent since Mr. Roman was detained. His daughters are also undergoing psychological treatment after their father’s detention. I urge you to use prosecutorial discretion in the case of Manuel and release him from detention immediately. Read the request from Manuel’s attorney for ICE to close his case and follow it’s own criteria below.